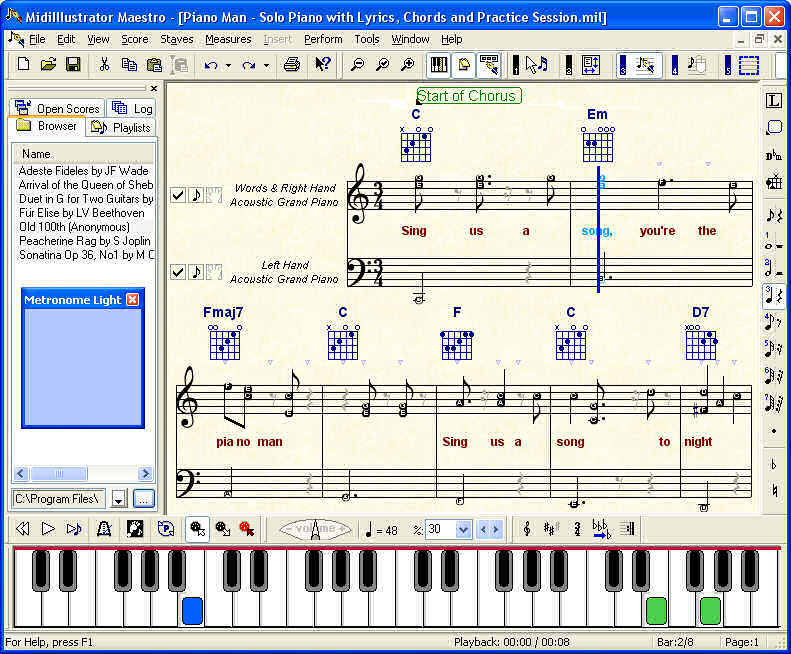 Midi Notation Software: Notate, print, practice & play free Midi sheet music. Rallentando Software's MidiIllustrator brings your favorite songs and musical works to life. Convert 1000s of Midi & Karaoke files freely available on the World Wide Web into dynamic, interactice scores & fake books. Boost your musical abilities with MidiIllustrator's range of user friendly learning tools. Learn new music step by step, sight reading notes from the staff OR without reading a note using lead sheets with chord notation, guitar frets & the on-screen piano keyboard if you prefer. - Bring your scores to life! See the notes light up as they are played back; the pages turn automatically. - Display difficult pieces in simplified form with a single click. Instantly convert Midi files to solo Piano arrangements. - Clarify complex notation using colours & sizeable fonts. MidiIllustrator organises the music to fill the screen & make the notation easy to read. - Edit the notation & modify the underlying Midi tracks. Transpose individual parts of the score. - Format many scores at once using the Task Wizard. - Sophisticated Midi to Notation technology identifies complex musical ideas, such as tuplets and multiple voicings. - Use MidiIllustrator's user friendly tools to help you playback, perform & learn new pieces. - See each note step by step with the flexible on screen keyboard. - Rapidly develop your sight-reading ability. Practice rhythm with the visual/audio Metronome & beat markers. - Generate Fake Books & Lead Sheets with lyrics, chord names & guitar frets. - Sing along with your favourite Karaoke tunes and Choral works. - Connect a Midi Instrument & interact with the music.